Earth Day reminds us to reuse, re-purpose and recycle. But, it doesn't have to be all about washing out aluminum cans and milk jugs, bundling newspapers or going through closets to discard clothes that no longer fit or are not fashionable. I picked up this hank of a yarn made from recycled blue jeans this past weekend at Stitches South. It's called Riveting, by Kollage Yarns. Another yarn made from recycled knit fabrics left over from Europe's ready-to-wear industry is Remix by Berroco. Gaia, a short sleeve cardi designed by Kristen TenDyke, is a Free Pattern that showcases this yarn. 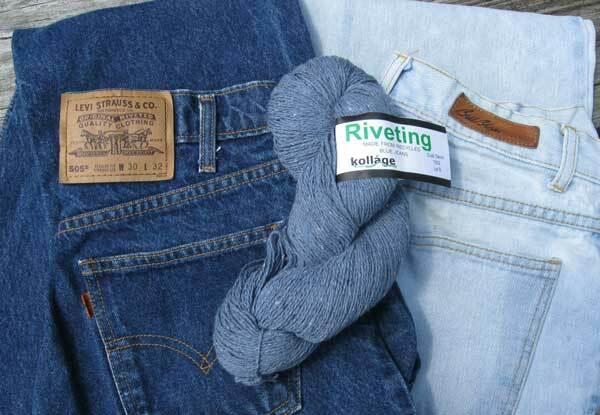 So, green up your knitting, support the repurposing efforts of the fiber industry and create something comfortable and environmentally-friendly... in blue, green, natural or whatever color makes you feel good! Hi Veronica - the link for Pattern Suggestions is not working correctly. Thought you would like to know. Yes. It is a choice we have to make.